This Monday's Magnetic is China Glaze You Move Me from the Magnetix collection. It looks darker in the bottle than it applied on my nails. Before the magnetic effect it is all a light brown, almost taupe color that you see in the lightest parts of my mani above. Sorry I didn't take a before photo! 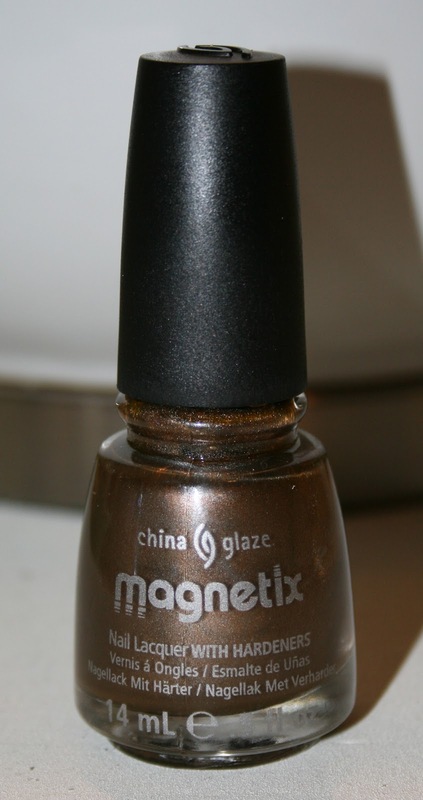 Before I get to the magnet comparison, I have to say that the formula of this polish is the best I have seen yet in a magnetic polish. Most that I have used are on the thick and even gloppy side of the polish spectrum, but this polish applied like a dream! I used one coat on all of my nails then I applied a second coat one nail at a time holding each magnet over the nail for 15 seconds. Since I did not buy the magnet that was available separately in this collection, I thought this would be a great time for a magnet compsarison! The Nails Inc magnet wins for the most crisp design. The Magnetique magnets come in second and the Julep magnet gives the most blurry magnetic effect. As I have mentioned before, my nail beds are very curved and it is hard to get the magnetic pattern to reach the sides of my nails because the magnets are not curved. The design created by the Nails Inc magnet almost reaches all the way across if I place the magnet just right. So, Nails Inc also wins for covering the most area on my nails. As far as pattern design, Magnetique wins! I love the star and the strips are cool, too. You can make vertical, horizontal or diagonal stripes with the same magnet. The only problem is that you can't tell what direction the stripes will go by looking that the magnet. I'm going to have to try to figure out a way to mark the magnet so it is not so tricky to create a uniform mani. I have worn this mani for 3 days now (and still going) with no chips and moderate tip wear. I was a little on the fence at first, but I'm liking the multi magnet effect and getting lots of compliments! What do you think of it? What is your favorite magnet and/or magnetic polish? Very interesting comparison! I didn't even realize Julep had magnetics--the magnet looks like the Piggy Polish ones I saw at Ulta today.